Transform any living room or small space into guest sleeping space with this convertible sleeper chair. 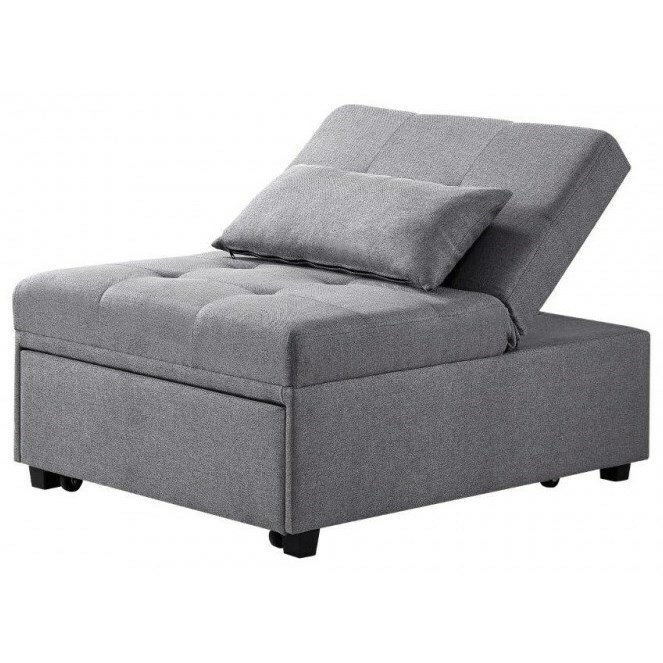 The chair base pulls out to transform the chair into a full chaise - perfect for overnight guests or lounging. Button tufted detailing pairs with the chair's simple silhouette for a relaxed modern look, while the angled back and throw pillow are perfect for kicking back and lounging. The Dozer Pullout Sleeper Chair with Tufted Seat by Powell at HomeWorld Furniture in the Hawaii, Oahu, Hilo, Kona, Maui area. Product availability may vary. Contact us for the most current availability on this product. Length (depth) with Sleeper Open 75.25"
Pillow Includes self toss pillow. Leg or Skirt Plastic legs. Frame Construction MDF, Solid wood, foam construction.